The central idea for our new unit of inquiry is ‘We grow as learners through meaningful, purposeful inquiry’. I explain to them that I will be handing over the responsibility of planning the independent inquiry over to them. They will have ownership over the skills, dispositions, concepts, and knowledge they acquire through this process. 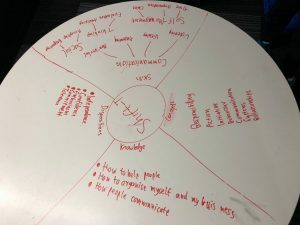 I show the students how the teachers plan for units of inquiry, that we share our ideas out on a table with whiteboard markers (and coffee) so we can scribble, brain-dump, discuss and document our thinking. I go through the four quadrants and explain what they are, why we put those points down and how they are each equally important to the learning process. Today, after a conversation with a student late in the afternoon yesterday, I offer to model this planning process with anyone who wishes to see it. I’ll use a table in the room and whoever can fit around the table is free to join, contribute, pinch ideas, come and go, ask questions or take photos. 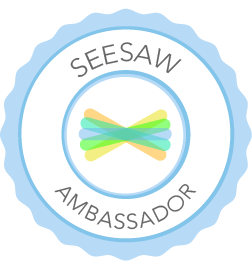 We consider as a small group of five how we might build on L’s idea about using his knowledge about technology, namely gaming, coding, and hardware to further develop him as both a learner and a person. Some ideas include connecting the particular skills, such as communication or self-management skills. L is a technology aficionado… he and I both know he is very handy when it comes to his astute knowledge of technology devices, gaming, coding, hardware etc. He says he’s already really comfortable supporting others with technology, but wants to take it to the next level, something more real, and we discuss the concept of entrepreneurship. And so, Shift-T is born, his company name (and a take on his nickname). Now that he can name his inquiry, he already has bought into the first steps of the journey and it is his. 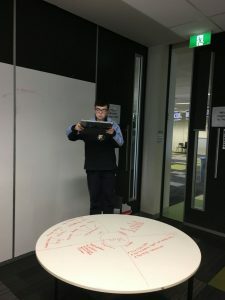 We discuss that given he already has such a wealth of knowledge about technology, that we could learn more about him as a person through this inquiry. 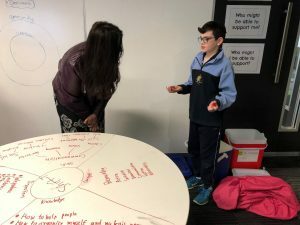 Rather than this inquiry becoming more time for a tech-savvy student to spend with technology, he is going to explore how he can build confidence, tolerance for others, responsibility and independence by supporting his peers and teachers. I'm a primary school teacher at an IB PYP school in Melbourne, Australia. I believe in establishing positive environments in which students can develop confidence and curiosity, while nurturing the skills that will benefit them outside of the learning space.